TUI Cruises has taken delivery of their second newbuild. Mein Schiff 4 is a sister to Mein Schiff 3 built by Meyer’s recently-acquired yard in Turku. The ship is 99,500 gross tons with a length of 964 feet and a 118-foot beam. The complete story appeared in the May 8 edition of Cruise News Daily. Viking Ocean Cruises has agreed to accept delay in delivery of their third ship from Fincantieri. Viking Sky, originally scheduled to enter service in June 2016, will now be delivered until February 2017. That means it will miss the peak summer travel period in Europe. If two are good, four are better. It sounds like a strategy for the Lido buffet, but in reality, it’s Royal Caribbean’s strategy for ordering a fourth Quantum-class ship. The line said this afternoon they had agreed with Meyer Werft to order a fourth in the series, subject to the customary conditions, including financing. Delivery will be in 2019. Today is a somber anniversary for Cunard. It is the 100th anniversary of the sinking of Cunard’s Lusitania by a German torpedo. Queen Victoria operated a special sailing this week to commemorate the event. Aboard were many families of those lost on May 7, 1915. At 3:30am this morning, Queen Victoria stopped over the wreck off the Irish coast while Cunard officials and families dropped wreaths and flowers in the sea. Also aboard was one very special “passenger” who was there on that fateful day a hundred years ago. Pandora Jewelry will have duty-free stores aboard five P&O Australia ships featuring the company's popular charms. In case you’ve never thought about it, if you’re celebrating a special occasion, it can become an extraordinary occasion if you celebrate it on a Princess Cruise. The complete story appeared in the May 6 edition of Cruise News Daily. Carnival Corp making a generous donation to earthquake relief in Nepal. Details appeared in the May 6 edition of Cruise News Daily. The way to get the attention of a crowded market is for a cruise line to deploy its newest ship there directly from the shipyard. It was always a given that new ships would come to the Caribbean. Then the battles moved to the Mediterranean, and so did the new ships. Now the battles to be noticed are in Asia, especially China, so new ships are going there. Princess joined that game today by announcing their next ship, the third in the Royal Princess-class, will go directly to China from the shipyard in the summer of 2017. Carnival Vista is just a year away from her May 1 (2016) inaugural cruise in Europe. 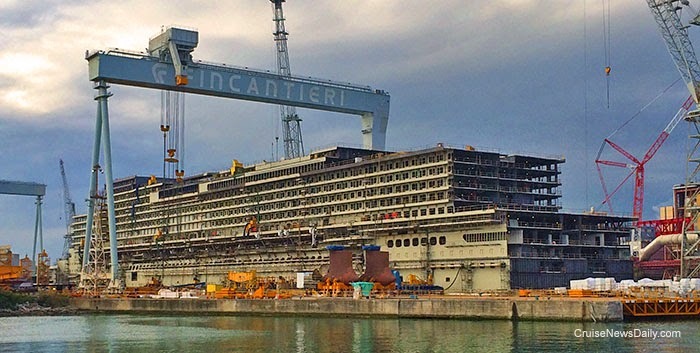 It’s currently under construction at Fincantieri’s Monfalcone yard, and right now, it looks more or less like just a big ugly hunk of steel. But a year from now, the ugly duckling will become a beautiful white Carnival ship. The features are shown in the video below. Silversea’s Silver Shadow has again failed their US Public Health Inspection. The last time this happened was in July two years ago, but that time it gave the luxury line a very conspicuous black eye because the CDC found that the management of the ship was trying to deceive the inspectors. MIAMI, May 4, 2015 – Royal Caribbean International, the world’s largest global cruise brand, today announced John Suley as the cruise line’s vice president of Food and Beverage Operations. Chef Suley will oversee more than 265 individual restaurants aboard 23 of the most innovative cruise ships sailing around the world. Chef Suley was formerly the associate vice president of Food and Beverage Operations for Celebrity Cruises, where he led all menu development and implementation, chef recruitment and training. Most recently, he was instrumental in the brand’s many recognitions in the Wine Spectator 2014 Restaurant Wine List Awards, as well as the lauded launch of Celebrity’s suite-class restaurant Luminae. Prior to joining Celebrity Cruises in 2011, he was the executive chef at three-time James Beard Award-winner Alfred Portale’s Gotham Bar and Grill in New York City and Gotham Steak, fomerly at the Fontainebleau Miami Beach. The innovative Chef Suley also has worked at high-profile hospitality brands, including the Ritz Carlton, South Beach, Waldorf Astoria and St. Regis Hotels, and alongside some of the world’s most accomplished chefs, including Daniel Boulud. Chef Suley has been recognized for his unique culinary vision and leadership with several nominations and awards, including being named 2010 James Beard Foundation “Rising Star Chef” nominee, and 2007 “Rising Star Chef of American Cuisine.” He is also a graduate of the Culinary Institute of America. Cunard's fleet met at Southampton today to mark the start of the line's 175th anniversary year celebration. At the end of the day, they sailed out of Southampton in formation. 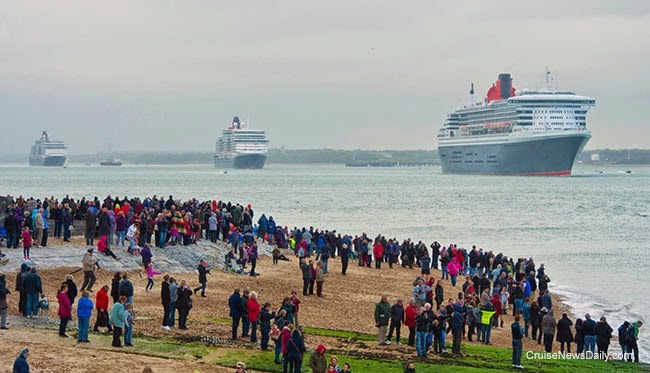 The photo above show spectators watching at Calshot as Queen Mary 2, Queen Victoria and Queen Elizabeth sail for New York, Guernsey and Hamburg respectively. Photos courtesy or Cunard and James Morgan. All rights reserved. May not be copied or used without permission.